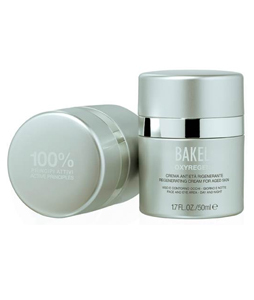 BAKEL has just introduced Oxyregen - a regenerating cream that stimulates cellular oxygenation with ten active ingredients. Developed by Italian chemist Dr. Raffaella Gregoris, for daily and nightly application, the molecules used in the development of the cream absorb quickly and give a calming effect on the skin, making it ideal for sensitive skin types. Saccharomyces Lysate is the premium ingredient, an oxidizing yeast that stimulates cellular oxygenation and activates skin regeneration, leaving skin plumped. Extracts of olive, jojoba and avocado oil deliver nutrients to the skin and provide elasticity and an overall anti-ageing action. Bakel Oxyregen is available exclusively at SPACE NK and http://www.spacenk.com/ from March priced at £85.00 for 50ml.